All the best products for learning Taijiquan! 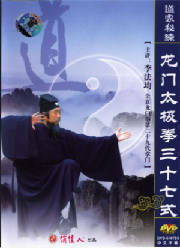 For UK Tai Chi Shop Click here! Before we take up Taiji we should have an understanding of its structure and quality. The basic skills are from the below to the top, relax with the toe, heel, knee, crotch, elbow, waist, shoulder, wrist, hand, and fingers. All are successive. This is Nine Relaxing. The Ten Need are: keeping the buttocks down, wrapping the crotch, shrinking the abdomen, dropping hips, extending the chest, making the back round, emptying armpits, and straightening the neck. One lightness: Pushing the head up in mind. The Conghui point as the Yang peak and the Baihui point as the Yin peak. click picture for more info. This Special Edition DVD is over four hours long, with hours of additional content not available on VHS. 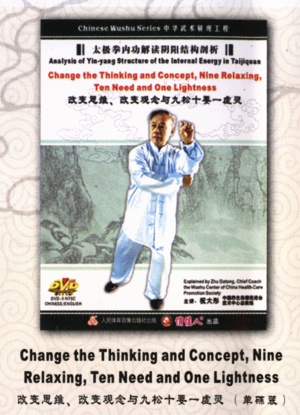 This comprehensive video is not only an instructional DVD, but a living document designed to preserve a cultural tradition from the original Yang Style lineage. Practice of this living, vital form will bring you a healthy and relaxed body, a clear mind, and a strong sense of martial intent. This Tai Chi Chuan program will offer you enough content to build a solid foundation for a lifetime of practice. DVD SPECIAL FEATURES: Hundreds of Scene Selections • Interactive Feature: Click the Yin/Yang Symbol to open up In-Depth Instruction of the Form • Over 2 hours of additional content • Language: English, French and Chinese • Subtitles: English, Spanish, French, Italian, Dutch, Polish, Portuguese • All Regions Encoding • Previews of all video titles • Interactive YMAA Product Catalog • "About YMAA" section, and more. It was reported as a kind of Kungfu which can continue and prolong the life .As a secret Kungfu ,it was refused to discuss for centuries.Regular exercises such skills can treat some strange and difficult disease. It is almost suitable for human rehabilitation of chronic diseases, especially for neurasthenia, neuralgia, hypertension, heart disease, kidney problems, arthritis, diabetes, etc. have a good efficacy. Looking a specific style of Tai Chi?